Prophix Review: "Need something more powerful than a spreadsheet to develop your budget?" Currently, we use Prophix to produce financial statements, forecast revenue monthly, forecast salaried personnel, and update quarterly and annual budgets. Prophix is being used by the entire organization at the management level. Prophix helps us to focus on where our revenue is currently coming from and helps us to focus on where the needs are in the future for additional personnel based on growth forecasts for our jobs. Prophix provides us a place to drive specific data out of our ERP into a format where it can be analyzed in many different ways (across time, across departments, across accounts, etc.). Prophix gives us multiple ways to analyze the data that we have chosen. Along with data entry points for items in our goals or budgets, there are also ways to use formulas of different types to project future costs or revenues based upon assumptions that you program into the system. The "What If" can be built and then switched on or off to see the changes. Prophix doesn't limit the types or volume of data you want to analyze. If you have multiple years of data, it doesn't slow down because you have to keep using the same formulas over and over to churn out results. The formulas are separate from the data which allows the results to flow much faster than spreadsheets. I think that Prophix could structure their support and offerings based upon the needs/skill level of their customers. Customers that don't have the expertise on staff could be given additional help to develop their use of the software. Those with a higher skill level could be shown the depth of the product to gain additional ideas on different ways or items to analyze. Thus, increasing their own knowledge base as a springboard for additional customers. Prophix gives you a great ability to use your current financial data and forecast future revenues and expenses. This, by itself, is a great selling point alone. The additional level of data analysis ability pushes it over the edge. If the data is in your ERP and you want to know something about it, Prophix gives you a way to get that answer. Prophix: "ROI - Rate of Irritation?" In the past we have used Prophix for end of month and budget reporting. Currently, I am not using it because of industry-related staff reductions. Finance has been the sole user of Prophix. I plan to dust off Prophix and get back into the Personnel Planning module in 1Q19. Lots of features that I want to explore and use for forecasting purposes. The various dimensions allow you to "slice and dice" your data with great efficiency. The modeling functions are very helpful, whether planning for personnel or CAPEX. The Ad hoc reporting has been especially useful for quick reports. The functionality seems limitless. If you able to allocate resources to maximize Prophix you will not be disappointed; however, it does require some formula prowess to achieve results. Part of the reason I am not currently using Prophix is the process to import the data from my ERP. Mastering the functionality of the software takes time. For me, I need to be in Prophix almost daily to build proficiency. Update- this still holds true. Prophix shines with its Personnel Planning Model. Once setup, the manipulation of parameters are excellent for evaluating the cost of personnel in unlimited scenarios. The budgeting and forecasting are particularly helpful. Prophix Review: "Affordable tool with growing user base. Easy to use." We use Prophix for managing our annual operating budget and projections. Easy to use. Easy to set up views and templates. Runs reports for budget comments across departments. Useful for analysis. Allows pivoting and cutting/slicing summaries and easily changing views to show leaf descendants of the members. Slow. Opening a new view or entering a comment often has a several second delay. Should just be instant. Running a comment report takes almost a minute. Limited licenses - have to juggle number of users. Ad hoc view does not list your cost centers in a logical order and it is not as simple as a FRX frd file where the tree of cost centers is cleanly outlined and you can drill into levels of the tree without getting lost and having to go back to a long list. Ad hoc simply has a long list of cost centers that are not in order. Depends on what the needs of your business are. Prophix is a great budgeting tool and it avoids the headaches of more expensive options (i.e. Cognos which is not easy to use and requires consultants to modify even simple things). User Review: "Prophix - the good and the other"
We use Prophix for budgeting and reporting budget to actual numbers, as well as some forecasting. 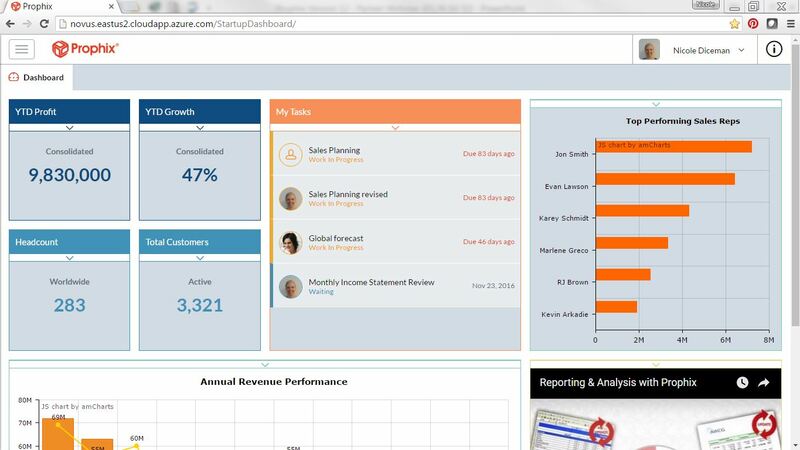 It is used mainly by the business office, but dashboards have been created for executives and marketing. It facilitates a more granular approach to budgeting, as well as multiple perspectives on comparative analysis. It also facilitates presenting financials in multiple formats, as required by different reporting entities or foundations. Provides a plethora of options for analyzing data, either numerically or graphically. Allows the user to get as granular as you like in creating budgets, and in creating mathematical relationships between related gl accounts. Can be applied & used across a wide range of departments. Useful for any type of data analysis whether numerical or other. It would be nice if it had better integration with Quickbooks. As it currently stands, you have to use a third party program to "translate" the database from QB to SQL for Prophix to import the data. I spend more time than I like validating data, but this has more to do with the limitations and shortcomings of QB than Prophix. The process of updating the software is rather cumbersome and involved. If your budgeting process is mired in pages and pages of spreadsheets, or if you need to present the budget in multiple formats, Prophix would be a good fit. It is helpful if your accounting software uses a typical database structure such as (or similar to) SQL or MySQL that can be directly tied into Prophix. Review: "Prophix tackles the Quickbooks Reporting issues"
Prophix is being used as a reporting tool, we use it to pull data from QuickBooks into the financial tools that allow us to budget and compare actuals as well as forecast. We are currently growing our experience to include more users and expanding from QuickBooks to other financial software. Prophix will allow us to this seamlessly. Prophix works well by pulling data from any source including QuickBooks and is capable of combining and re-sorting the data into very useful reports; the reports are user adaptable as the business changes. User Review: "Short on IT, then choose Prophix"
Prophix implementation is being managed in two phases: the first phase has focused on descriptive uses (i.e. real-time budget reports at the department manager level, P&L reports, income statements, balance statements). The second phase will focus on predictive reporting. We plan to add data inputs from our ERP system that will allow for a more in-depth budget forecasting capability. Our business problem was the fact that our previous financial reporting platform, Microsoft Management Reporter, did not meet the needs of the business. We found, in addition to the possibility that MMR could be deprecated just like Microsoft's previous reporting system, FRX, had been deprecated, that Management Reporter (1) was difficult to develop new reports, (2) was restricted to an on-premise solution which requires resource expenditures - capital, physical infrastructure, and personnel, and (3) did not allow for real-time updates of end-user reports. Prophix is web-based and can be linked to Active Directory authentication. This allows end users access to budget reports from any Internet accessible computer while still requiring authentication with your company's user credentials. Prophix has a "drill across" function that allows an end user to easily display transaction details for any selected line item expense. Not only is detail provided for the current billing cycle, but all YTD details are displayed. While the web page is a responsive web page (meaning the page size adjusts to the screen size of the device), it is not 100% responsive. This results in a less than desired user experience (in other words, accessing the web page on a phone is possible but can be a bit frustrating). To be perfectly honest, I have yet to come across an instance when the Prophix platform has not outperformed our legacy platform. Review: "Prophix saves our company time and money"
We use Prophix on the finance team for budgeting, personnel planning, analysis, and financial statements. Prophix addresses several problems: it provides flexibility with respect to budgeting and reporting in fact, it completely replaced Excel as our budgeting and reporting tool. The dynamic nature of the Prophix tool is unlimited. As a marketing organization, we frequently evaluate where our marketing efforts are most profitable. Prophix allows customized reporting by revenue stream, giving us the ability to understand exactly where our efforts are either successful or unsuccessful. In financial statement preparation (alone) each month, Prophix saves my team hours of needless Excel work. Multiple iterations of an annual budget are a breeze with Prophix. Prophix makes monthly financial reporting easier and faster than other software I have used. Prophix makes personnel planning faster and more accurate than using spreadsheets. Prophix makes budgeting and forecasting easier and more accurate than using spreadsheets. Everything has room for improvement. I would like to see better graphing, but Prophix is already working on product development in this area. It is well suited for organizations that store data in multiple programs or data warehouses. The personnel planning functionality is very helpful if you have multiple items that roll up into compensation and need to calculate them by employee/department. When you have multiple departments contributing to the annual budget, Prophix makes it very easy for the end user to participate in the process. 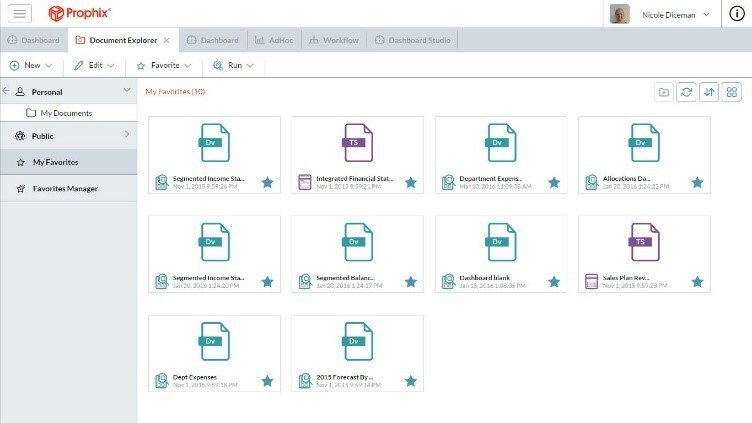 Review: "Prophix is a solution that is all about the user and their experience"
Right now, Prophix is being used by the Accounting and Finance departments. We are looking to expand to other divisions of our company. We originally had been looking for a program to solve our budgeting issues and constrictions. We have expanded our need and now use Prophix for many other applications. Prophix is a great solution to get out of the Excel world of forecasting, budgeting and financial reporting. Prophix has the ability to customize financial reports and made the distribution of reports effortless and errorless. Prophix breaks out of the world of using Excel to generate forecasts and budgets. Excel works for these processes, however, there is an element of human error. Prophix removes that issue and makes the process extremely seamless. Prophix currently being used by the entire Finance department for budgeting, forecasting, financial and utilization reporting. Thanks to Prophix, we have decreased the number of days spent doing these tasks. Any organization that has several users accessing financial and utilization data can greatly benefit from Prophix. We needed a program robust enough to provide financial results across the entire organization at a more granular level, a budgeting system that includes personnel planning, and, in the future, create incentive comp models currently housed in excel format. We want to be able to automate as many time consuming processes as possible. Appropriate for personnel planning, actuals to budget reporting, and consolidations, and not appropriate for cost accounting. Prophix Review: "Excellent reporting capabilities"
Prophix is used throughout the organization at the executive and leadership level to view financial results and enter budget data. We chose it because of its superior reporting capabilities and streamlined budgeting workflow. User Review: "Prophix is excellent!" Our Financial Planning and Analysis department uses it to report on home office expenses company-wide. We also use it for budgeting company-wide. It replaced previous software that we use for budgeting that was in an unstable environment and not user-friendly. 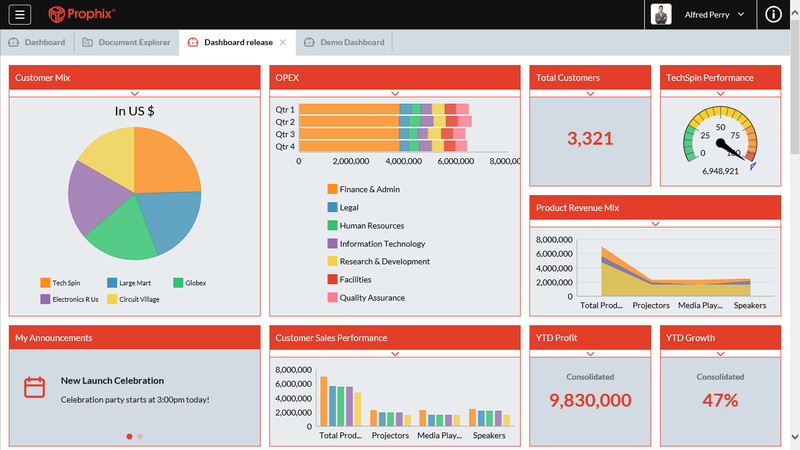 Prophix is much more intuitive and has a modern look. Our users appreciate the ability to look at expenses at a high level, and then if they have questions, they can drill across on those sums for detailed transactions. Prophix allows non-finance employees to create their own reports so they can look at the expenses hitting their cost centers. They can view at a high level, or just click on the total to dive into the detailed transactions. The Prophix consultants have been very patient and are extraordinarily knowledgeable about every aspect of the software. They can always answer our questions and if they aren't sure of the answer, they talk to their engineers and get back to us quickly. We've had a few issues with our drill-across view being functional, but they are working to fix the issue. Other than that, I can't think of anything they should do differently. Prophix has been great for expense reporting, budgeting, and we will also soon be using it for Project reporting and budgeting. Prophix was not built to show transnational detail on a large scale, so there are a couple ways of reporting that we haven't been able to do. Despite this, they are working with us to show our detailed transactions. Prophix Review: "Flexible and cost effective mid market CPM solution"
We primarily use Prophix as a tool to consolidate and present out our global financials. It is managed by our finance team with minimal involvement from IT. Our users are located throughout the globe in our network of agencies. We also use Prophix for global forecasting and budgeting. We use both on prem and cloud interfaces. Prophix has enabled us to use a single platform for our global planning activities and consolidated financial reporting. The Web Client is great for a distributed user base. The user interface is relatively intuitive and easy to work in. Once implemented, the system is easy to administer so IT assistance is minimal. Potentially not needed at all in Web version (depending on config/design/business needs). The Web Client is still being enhanced. There is certain functionality available in the on prem client that is not yet available on the web. Formatting templates can be tedious. Excel based interface is good but can be quirky when using formulas. Consolidating financials and forecasting and Budgeting. The input templates are relatively easy to create and maintain. With good design (template and process), it can be a seamless tool to gather forecast and budgeting data from end-users and summarize for top-level reporting. Works well for multi-location/country organization (handles fx well). Versioning works well as long as you don't need too many versions (20+ especially if using calculated versions). Good functionality and excellent value for mid-market solution. Prophix Review: "Great software - Still learning a lot"
We currently use Prophix for Budgeting, financial reporting and forecasting. We use the workflow manager to allow many users to input budget data, and at this time about 25 users have access. Great financial reporting. I think after we get our feet under ourselves it will be a great time saver. We are currently in the process of reviewing our model set up and hope to continue making improvements. User Review: "Prophix - By Finance for Finance"
Prophix is used by our entire organization to varying degrees. The whole organization uses it for our annual budget, but we're in the process of making elements of Prophix easier to use so that the rest of the organization (outside of just Finance) have a desire to use it year-round. Various Finance teams use it year-round already and it's become our preferred way of reporting financial results internally. Pivot table like ability to view and adjust information via ad-hoc. Prophix uses processes called infoflexes which are extremely flexible and enable you to easily automate very complex allocation logic. Provides the ability to drill into sub-detail via their "Drill Across" functionality. The built-in report builder is clunky and limited in terms of ability to format reports. The performance (on-premise, not cloud) can be slower than users would like, particularly when dealing with lots of data within DPM. Error messages are not particularly helpful, even for the administrators. Still have to frequently contact Prophix to understand what an error message means. Workflow functionality is extremely limited and minimally customizable. Ability to control aspects of security is limited, and requires creative workarounds in order to meet the required internal review structure. Prophix has allowed us to easily recreate some of our complex allocations so we can manage our whole budget process within Prophix. It also provides a very clean and easy to use interface for accessing financial information quickly. Unfortunately, we have not been able to completely eliminate our reliance on Excel. Some on my team still prefer building/formatting their reports in Excel because of the limited functionality and formatting available in Prophix's built-in report builder. Prophix Review: "Does Its Thing and Does It Well"
Built on Microsoft SQL Server stack, which is ideal for our org as our other systems are based on the same and we can set up highly customized integrations using familiar technology. Robust framework for Detailed Planning of HR, CAPEX, etc. plus ability to define workflows to support custom business processes in these areas. In general, pace of innovation and development is somewhat slower than what I have come to expect from leading software companies. I have not seen a truly "new" idea or feature introduced in the 5 years I have been a customer, although I have no complaints about the functionality it does support. Prophix is ideal for organizations that want to formalize their processes around consolidated reporting, planning and/or forecasting. "Prophix Review from a Consultant"
We implement Prophix for our clients. Most of our clients use Prophix for their Financial Planning & Analysis function - budgeting, forecasting, allocations, financial reporting, etc. It is well suited for any organization that uses Excel to do their budgeting/forecasting. From a scalability stand-point, It is suitable for small to mid-size companies(less than 100 concurrent users). Used for internal reporting, budgeting and is used across the whole organization. It addresses reporting. It is very good for internal reporting and bottoms up budgeting. It is not appropriate for changing forecast with lot of variables. User Review: "Prophix- Budgeting Easy Button"
As a company Prophix has been well received for budgeting and monthly reports. Our users use the drill across feature when reviewing their monthly reports and this allows them to answer many of their questions themselves. We currently are implementing a long term financial forecast in Prophix that will allow for several what if analyses. We use detailed planning manger for loans and interest. We also have other cubes for specific areas that are integrated with our main finance cube. Prophix allows managers to review in detail their department expenses. Managers can write comments and line item details during budgeting that allows for detailed descriptions. Detailed Planning Manager is awesome. Prophix customer service is some of the best I have experienced. Slow performance with complicated formulas and lots of data. Sometimes does not save to cube but does not let the user know and why. Wish you could set up default page members for templates. Would like to see ability to use template calculation process for templates with annual time periods. Prophix is well suiting for budgeting and reporting. It takes a lot of work to set up but once it is-- it runs seamlessly. Wish it was easier to roll over budget /forecast data and that consultants had that same answers. On more than one occasion have received conflicting information from 3rd party consultants and different consultants within Prophix. User Review: "Prophix Transformed Our Reporting"
Prophix is being used to consolidate financial and human resource information across our family of agencies. We import actual financials from our ERP on a daily basis and manually enter forecast data on a quarterly basis. Using template studio we build reports that are used to complete the board package quarterly. We also track employee headcount, salary, utilization, and work distribution in Prophix. Currently, our finance and client services departments are the only departments using the tool. The biggest problem that Prophix addressed for our company was the consolidation and reporting of financials across our network. Before Prophix we used excel to do all of our consolidation. Prophix has made the consolidation process much more efficient and more effective. Consolidations -- We can easily enter data in a multi-dimensional way that allows us to analyze our data in an efficient and meaningful way. Report building can be difficult at times, especially when moving data views, adding/removing rows and columns, and resetting data views. Having too many versions in the Versions dimension slows down the system a bit. Prophix would be perfect when having to compare financials across time or versions. Prophix would also be great for tracking statistics. It would not as appropriate for tracking hours against jobs. The current state is primarily used by finance departments, and future state will be used by accounting and development departments. Prophix is well suited for flexibility in reporting financial and non-financial metrics. Our finance team primarily uses it, but we’ve also used it to roll our reports to operations in the field where they can pull financial information on their performance of business they manage. It is great for running complex processes on large steps of data. Some manual manipulation scenarios and calculations are still better in Excel. Prophix Review: "Easy to Administer"
Used as data aggregation & reporting tool. We're utilizing this to export Multi-tab workbooks & provide reporting to executive level staff. Prophix is terrific consolidation application. If you need to source data from multiple places - you can do it very easily with no other tools using the Process Manager. Prophix is being used to manage workflows for budget and forecasting purposes. At one point we used hundreds of Excel templates to manage this process, but thanks to Prophix we have one system that can manage it all. Users can also see their monthly tracking by logging in through the system. Prophix is suited for companies that want a [hands-on tool where] the IT and finance departments work well together in the implementation and running of the product. It also works well in companies that are worried about security because of the detailed functions it has in the model cube. It is pulling the financial information from the ERP and finance department. We use the data to generate financial reports packaging and also budgeting. The way to set up a new template. The license restrictions when setting up production, development and UAT servers. Prophix should have some flexibility as other ERPs. Prophix’s innovative Corporate Performance Management (CPM) software promises to help you achieve your goals more successfully. Improve profitability and minimize risk when you automate repetitive tasks and focus on what matters. Budget, plan, consolidate and report automatically. Whether in the cloud or on-premise, Prophix promises to support your future with a platform that flexes to suit your strategic realities, today and tomorrow. For more information, visit www.prophix.com. Prophix software is the right balance of simplicity and depth of functionality, delivering a CPM solution that is easy, powerful and enables collaboration. Prophix provides a single, unified CPM solution for budgeting, planning, forecasting, reporting, and financial consolidation.Prophix Visual Analytics makes working with data easier and more intuitive for CPM users. With one click information access and structured visual data discovery users can easily see the value in their data. Uncover powerful insights with stunning interactive charts and graphs Accelerate the path to analysis Quickly see data from various viewpoints and perspectives Enable many users to interact and adjust data on-the-flyAd hoc analysis and templates with Prophix have search capabilities for quick analysis and template creation so that you can interrogate and navigate across multidimensional data to get to exactly what you need in just a few clicks.Workflows with Prophix provide a quick, interactive overview of the tasks you are responsible for, either as a direct owner, or something that you have to approve. Workflow allows you to filter and show you all the tasks that are in progress, past due or finished with a clean interface, showing you relevant, important items right away. Prophix develops Corporate Performance Management (CPM) software that integrates financial budgeting, planning, reporting, forecasting, consolidation, analytics, scorecards and dashboards in a single, unified application budgeting software tool. Move beyond spreadsheets for budgeting with Prophix. Watch this short 1.5 minute overview about how Prophix will make your annual budget process more efficient. In less than 2 minutes see how Prophix gives you the ability to tailor your financial statements and management reports so that information is delivered in a way that’s both insightful and meaningful. Prophix provides structure reports around business requirements in an error-free, dynamic, and intuitive environment, resulting in better decisions, made faster. See a short 1.5 minute overview about how Prophix gives you a clear picture of all your operational costs and connects them with key factors that are driving your revenues. That increased line-of-sight is made possible because Prophix tracks and monitors all day-to-day operational planning activities. Improving operational outcomes for the short-term and providing insights into your future operations.